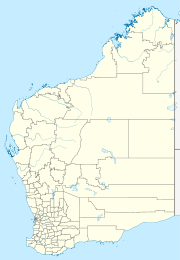 Tjuntjuntjara is a remote Aboriginal community in the southeast of Western Australia. It is located in the Great Victoria Desert, inside the Great Victoria Desert Nature Reserve. It is about 700 kilometres (430 mi) east of Kalgoorlie. The nearest place with more people is the town of Laverton, 460 km (290 mi). Tjuntjuntjara is connected to Irrunytju in the north by a dirt track. There are about 160 people living at Tjuntjuntjara. They speak a southern variety of the Pitjantjatjara language. They identify as belonging to a group of people known as pilanguṟu (meaning "from the spinifex plains"). This group of people are among those that were removed from their homelands in the 1950s and 1960s due to nuclear weapons testing at Woomera Test Range. Most of the people now living at Tjuntjuntjara were previously living at Cundeelee, then a Christian mission, further to the west. Other communities of pilanguṟu people include Oak Valley and Yalata, over the border in South Australia. Tjuntjuntjara was founded in the late 1980s. Cundeelee was being closed, so a group of elders led members back east to their homelands to set up a new community. The first choice for a location was Yakadunya (about 160 km or 99 mi of Tjuntjuntjara). A water bore was drilled and a temporary camp was formed, but there was not enough water in the ground. The community moved northward to what is now Tjuntjuntjara. Tjuntjuntjara has since grown into a large community. It acts as a service centre for several outstations. These outstations are occupied at certain times of the year for hunting and gathering and ceremonies. The community is governed by a local council. Facilities and services are managed by the Paupiyala Tjarutja Aboriginal Corporation, a non-profit organisation. The community has its own health clinic. The community school, Tjuntjuntjara Remote Community School, was opened in 2008. Both the clinic and the school are helped by the federal government. Mail is flown in by plane once per week. A truck delivers food supplies to the community once every two weeks. There is no police station. The Spinifex Arts Project was set up in 1997 for the community to create artworks. The community is growing. There were about 40 living at Tjuntjuntjara during the 1980s. In the 2006 census, there were 150 people, and in the 2011 census there were 162 people living in 17 houses. ↑ 1.0 1.1 1.2 1.3 "Tjuntjuntjara Tjukupa (Story)". Tjuntjuntjara Community Resource Centre. Government of Western Australia, Department of Regional Development and Lands. Retrieved 18 March 2013. ↑ 2.0 2.1 2.2 2.3 Wynne, Emma (18 June 2012). "Development challenge for remote community". ABC Goldfields. Australian Broadcasting Corporation. ↑ "Home page". Tjuntjuntjara Health Service. Retrieved 18 March 2013. ↑ "Tjuntjuntjara Remote Community School (5814)". Schools Online. Government of Western Australia, Department of Education. Retrieved 18 March 2013. ↑ "Shire Statistics". Shire of Menzies. 7 December 2009. Retrieved 18 March 2013. This page was last changed on 24 March 2018, at 19:14.